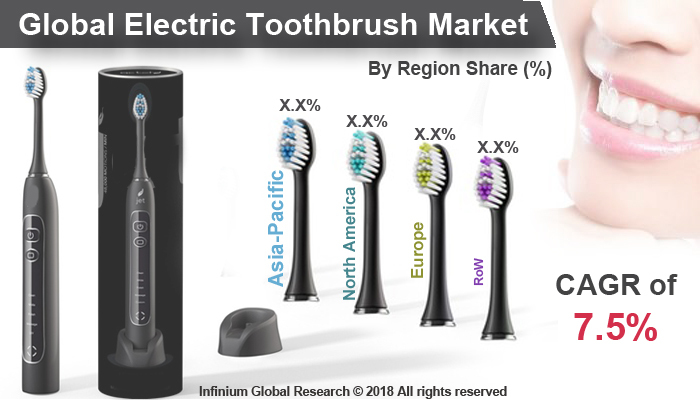 A recent report published by Infinium Global Research on the electric toothbrush market provides an in-depth analysis of segments and sub-segments in global as well as regional electric toothbrush market. The study also highlights the impact of drivers, restraints and macro indicators on the global and regional electric toothbrush market over the short term as well as long term. The report is a comprehensive presentation of trends, forecast and dollar values of global electric toothbrush market. According to the report, the global electric toothbrush market is projected to grow at a CAGR of 7.5% over the forecast period of 2018-2024. An electric toothbrush is a special type of toothbrush that is battery operated. This electric toothbrush can be both operated through rechargeable and a non-rechargeable battery. The toothbrush makes rapid automatic bristle motions, either back-and-forth oscillation or rotation-oscillation in order to clean teeth. Motions at sonic speeds or below are made by a motor. The rotation or side-by-side movement of the head in the electric toothbrush is effective in removing plaque and reducing gingivitis. Further, electric toothbrushes are incorporated with advanced features that enhance the brushing experience and improve brushing habits. Some of the features include various brushing modes that are specialized for sensitive teeth, whitening benefits, and gum-massaging actions. In addition, pressure sensors are installed in the toothbrush to apply required pressure on the teeth and gums during brushing. Growing urbanization and availability is helping to boost the growth of this market. This electric toothbrush helps to remove plaque effective compared to the manual brush and provide a charming personality to the person. Hence it helps to provide a good personality. Additionally, the availability of electricity helps to charge it whenever required. Hence, these two factors are helping to grow the market of an electric toothbrush. The main advantage of powered toothbrush over manual toothbrush especially among the differently abled population who lack manual dexterity, which required for optimum oral hygiene maintenance. Poor oral hygiene among the differently-abled population may be due to their functional limitations and limited access to undergo an oral examination. This problem is solved by an electric toothbrush, which has auto dexterity. Hence, this type of toothbrush is more popular among differently abled people. Hence, as the people with differentially able would grow, its market would grow. The Asia-Pacific electric toothbrush market is witnessing a rapid growth rate, as electric toothbrushes have gained popularity due to their improved cleaning of the oral cavity, compared to a manual toothbrush. In addition, the upsurge in disposable income in this region and an increase in the prevalence of dental caries drive the market growth. The report on global electric toothbrush market covers segments such as bristle type, head movement, and end user. On the basis of the bristle type, the global electric toothbrush market is categorized into soft and nanometer. On the basis of head movement, the global electric toothbrush market is categorized into rotation/oscillation and sonic/side-to-side. On the basis of the end user, the global electric toothbrush market is categorized into children and adult. The report provides profiles of the companies in the global electric toothbrush market such as Colgate Palmolive, FOREO, JSB Healthcare, Koninklijke Philips N.V., MornWell, Panasonic Corporation, The Procter & Gamble Co (P&G), Shenzhen Risun Technology Co. Ltd. and Church & Dwight Co. Inc. The report provides deep insights on demand forecasts, market trends, and micro and macro indicators. In addition, this report provides insights into the factors that are driving and restraining the global electric toothbrush market. Moreover, IGR-Growth Matrix analysis given in the report brings insight into the investment areas that existing or new market players can consider. The report provides insights into the market using analytical tools such as Porter's five forces analysis and DRO analysis of the electric toothbrush market. Moreover, the study highlights current market trends and provides forecast from 2018-2024. We also have highlighted future trends in the electric toothbrush market that will impact the demand during the forecast period. Moreover, the competitive analysis given in each regional market brings insight into the market share of the leading players. This report will help manufacturers, suppliers, and distributors of the electric toothbrush market to understand the present and future trends in this market and formulate their strategies accordingly.